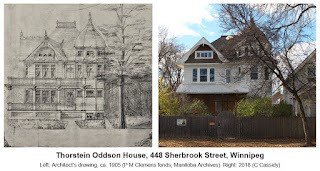 West End Dumplings: West End's Oddson House to be Demolished? West End's Oddson House to be Demolished? The West End is about to lose another fine home. The residence at 448 Sherbrook Street near Ellice was constructed in 1905 for Thorstein Oddson, a developer and real estate agent who had a big impact in the early development of the West End, particularly around the Burnell Street area. The architect was fellow Icelander Paul Melsted Clemens who designed dozens of buildings, especially apartment blocks, for Oddson and other Icelandic developers in Winnipeg. In recent weeks the house, which sits on a double lot, has been boarded up. Sorry to read about this, but also interesting to see this - Paul Melsted Clemens was my Afi on my Dad's side. And still not sure about all the buildings he designed in Winnipeg. Thank you for all the photos and information on your sites.